MSI Interceptor gaming mouse is the latest device in the gaming arena. It has, however, not gained much popularity amongst gamers as they don’t know that it is available in 4 different styles. The Interceptor DS100 is one of the styles that have been manufactured. It is meant for advanced gamers to provide them with an excellent gaming experience, and is in the same series by MSI as the DS200. The DS100 has been given an ergonomic design and a sleek yet symmetric frame, which means both left-handed and right-handed players can use it. It has been furnished in an all-black color and its dimension specifics include a height of 1.8-inch, a width of 4.7-inch, and a length of 7.9-inch. It weighs just eight ounces. Its design includes a default mouse wheel and two buttons on the top, whose function can be adjusted through the software. On the right side, there are two buttons, a DPI indicator, and a backlit zone. The latter two are also placed on the left side. The bottom of the mouse includes general details about the model and a button for changing modes and profiles. Its wire is braided and black and red in color. The connector, however, is gold plated. 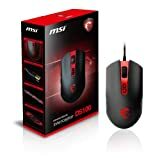 One of the most significant features of this mouse is its software, which is created exclusively to suit gamers’ needs. It is quite advanced and allows users to completely control the mouse. It offers adjustments to buttons and their functions when the user requires. The software also permits adjustments to backlighting, dots per inch (DPI) volume, clicking speed, and the pulling rate of the mouse. There are a few functions such as combo key and fire key, which help make gaming more convenient. Moreover, it possesses an embedded backlight which is available in 6 different colors. It is emitted through the MSI logo etched on the top of the mouse. The Interceptor DS100 has been equipped with a good memory which allows users to save up to ten profiles. Furthermore, it is plated with an advanced coating which prevents the mouse from slipping out of hand while playing. The Interceptor DS100 by MSI offers a quality gaming experience with software that is easy to use. The combo key allows users to set up a combination of keys into one hot key from the keyboard. This is especially practical when playing first person shooter (FPS) games or role-playing games (RPG). Moreover, the anti-slip coating and matte texture of the mouse not only offers tactile pleasure but also doesn’t hinder performance when playing with sweaty palms. Furthermore, the backlight provides a certain wow factor to the device and helps determine which profile is active, provided that adjustments to the backlight color have been made and a different color is selected for every user profile. Overall, the mouse has an average size and user-friendly software which makes it suitable for gamers who seek a good gaming experience but have a tight budget.